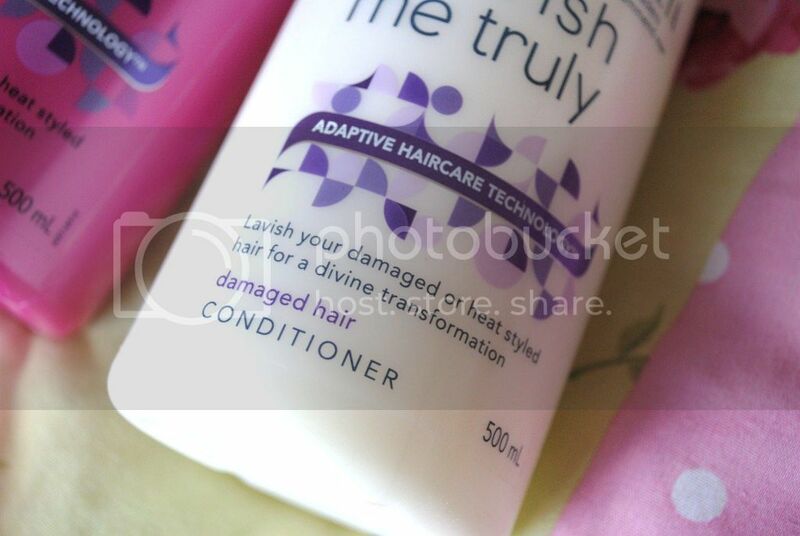 When it comes to shampoos and conditioners, I tend to go for the cheapest ones I see on the shelf. This is usually my trusty bargainous Alberto Balsam - for around £1 a bottle (and a deliciously fruity smell) you can't really go wrong. I also have a tendency to fall for whatever is on offer - my thoughts being; why spend a lot on something you wash down the plughole? Therefore when I was perusing Superdrug a few weeks ago, on the hunt for any hair and skincare bargains I could get my hands on, I spied the VO5 shampoos and conditioners for just over a pound a pop. Considering you get a rather hefty 500ml per bottle (and I am known to get through shampoo and conditioner like no one else - lots of hair and an obsession with washing it everyday, but I digress) this was an offer I couldn't refuse. Now, I've seen these big-bulky-kind-of-odd-looking bottles sitting pretty on the shelves before, but for around £3.50 each, they were simply out of my 'cheap as chips' price-range. Along comes an offer - and I'm sold. 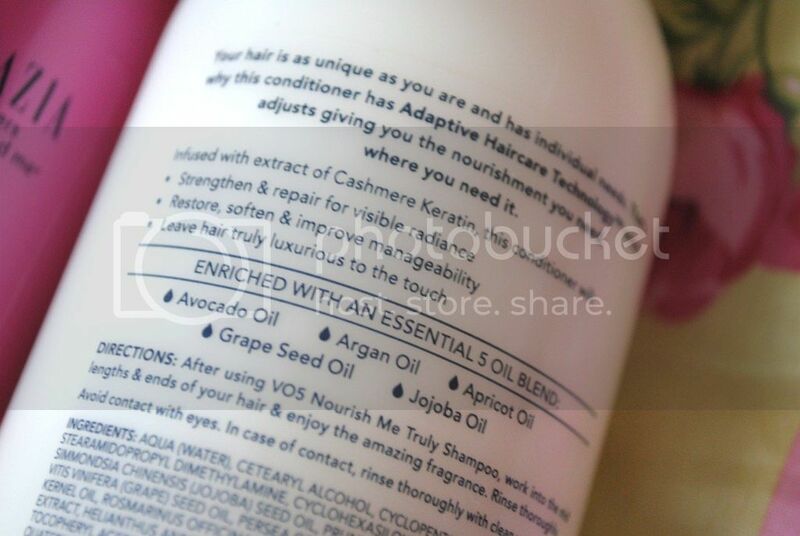 I happily purchased myself the 'Nourish Me Truly' shampoo and conditioner, after weighing up all my options (do I want moisture or nourishment?! One of life's many tough decisions), and looked forward to trying out the new products. To be honest, I've never really bought many VO5 products before - no reason why, just that nothing ever seemed to catch my eye - however, I am SO glad I got these as they are fast becoming my go-to shampoo and conditioners. I've been using the 'Nourish Me Truly' products for a few weeks now, and I am seriously impressed with the results. I am pretty renowned for having messy/birds-nest/matted/knotty/scare-crow-esque hair, which is dry, brittle and basically - a little bit crap. I don't look after my hair nearly as much as I should - I over-wash it, hate brushing it, and basically don't pay it as much attention as it so desperately needs. Therefore, when it comes to shampoo and conditioner, I need something that will pamper my hair for me. And this most certainly does. My hair feels SO incredibly soft once I've used these products, is easier to untangle and just generally feels smooth, light and in good condition. I'm guessing it has something to do with the '5 Oil Blend' described on the bottle; oils are all the rage these days, and I can definitely see why! Overall, I'm really, really impressed with VO5's 'Nourish Me Truly' products, so much so that I have already repurchased. 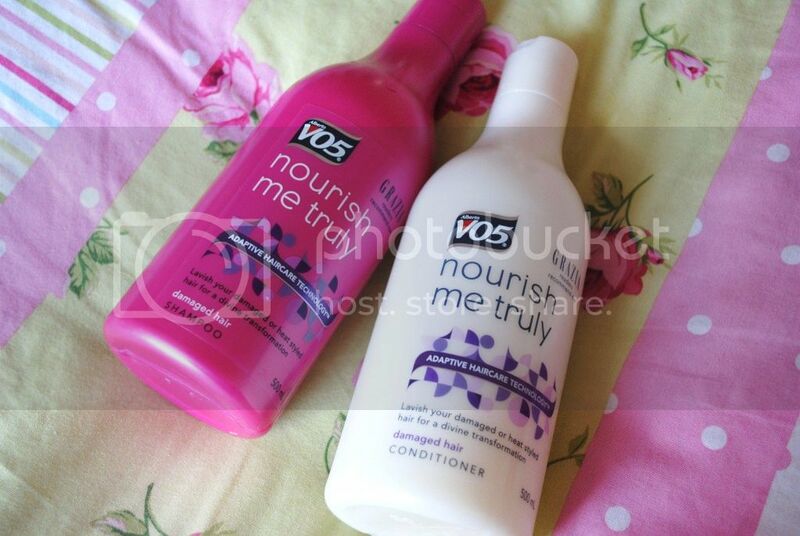 Have you tried VO5's shampoos and conditioners before? What did you think?